Last week SnapChat, used regularly by many children and young people, launched a new feature. SnapMaps allows users to see the location of their contacts. This feature allows others to accurately pinpoint where you are and shares your location. Today, the Digital Leaders have helped Mrs Thompson to run a parent’s awareness session as part of our Safer Internet Day celebrations. Parents were invited into school to see a short presentation on how to keep children safe online and learn about our Parent Area. The latest copy of the parent newsletter from eSafety Adviser Alan Mackenzie is now available in our Parent Area. Please click the link below and log in as a parent to read useful information about keeping your child safe online. This week, Oxford Grove are celebrating Safer Internet Week, in conjunction with Safer Internet Day, a global celebration which aims to promote the safe, responsible and positive use of digital technology for children and young people. 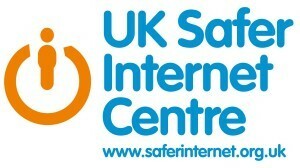 Please click the picture to visit the UK Safer Internet Centre website. We hope all the children enjoy their activities this week, and we hope lots of our parents can attend our special Online Safety workshop on Wednesday at 3:00pm, which will focus on potential risks online and how to start conversations with your child about online safety. Click the links below to visit some of our website pages that include links to Online Safety websites. 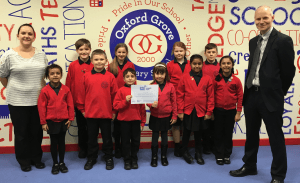 Oxford Grove has been receiving coverage online for our recent eSafety Mark award! Click here to see the report on SWGfL Online. Mrs Thompson’s Year 4 coding club has been working really hard this half term to design their very own eSafety Games in 2Code! Can you bust the computer viruses? Click here to play some of these amazing games! 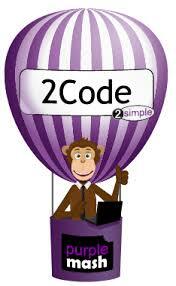 Please remember – the children have all started their code from absolutely nothing – great coding work, logic and problem solving skills, Year 4! 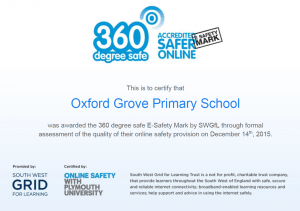 The team at Oxford Grove is pleased to announce that we have achieved our latest award – the eSafety Mark. This has been awarded for our provision in online safety. Not only are we one of only a couple of hundred schools across the country to achieve the eSafety award, we are also the first school in Bolton! Congratulations to all the staff who have worked so hard to attain this prestigious award! The latest version of the eSafety Parent Newsletter from eSafety Adviser has been published. Please click here to read all about keeping your children safe online over the Christmas period.